Activity in the gold markets has focused investors' attention on this unique commodity. 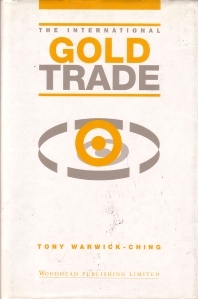 To provide the reader with a better understanding of the trade the book is set out in three sections. The first sketches the structure of the gold market from the point of view of the commodity analyst before reviewing in detail the institutions and practices of bullion and futures trading; the second looks at gold mining setting the boom of the past decade in the context of a longer term perspective; the third surveys the used of gold, past and present, and discusses the metal's future prospects. Part 1 Markets and trade: The structure of the market; Bullion trading centres and transactions; Bullion offtake and international trade; Futures and options. Part 2 The production of gold: Geology, mining and refining; Gold mining – the big producers; Gold mining – other producers. Part 3 The uses of gold: Jewellery; Industry and coinage; Gold as money; The gold price – history and prospects.